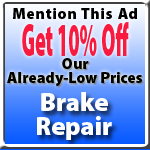 You’ll get plenty of breaks when you have a brake repair at NorAm Auto Repair Services! I resurface your brake rotors whenever possible to save you the expense of a new rotor. I use a variety of quality brake pads and shoes – from non dust-emitting ceramics that keep your shiny wheels from getting that dingy look, to high temperature pads for those heavy-duty applications. I only replace the parts that are deemed necessary for the safe operation of your vehicle, and will never sell you unneeded parts. This is a different policy than you will find at many brake shops. For example, it is common for brake shops to advertise a brake special and then end up selling you brake hydraulic parts, rotors, and drums when they are not needed. I have seen this happen to people countless times. If I find an actual problem with your brake system that necessitates replacing parts, I will show you the used parts and explain why they needed to be replaced for your brake repair. A regular brake inspection from a reputable Santa Cruz auto repair service will ensure your safety and will eliminate costly brake repair. At NorAm Auto Repair Services you can schedule a brake safety inspection with your next oil change. This is a service that is not provided by the quick oil change franchises. For those customers with standard transmissions, as a courtesy, we will also include a clutch inspection in case a clutch adjustment or clutch replacement might be required.